The sensational Volume Viewer shows an animation directly in the chart of the executed orders and volumes. Settings in speed and colour allow the trader to create actionable live information. An additional series of portraits profiling professional traders who use the NanoTrader trading platform are being added. Next is creative trader Andre Stagge. 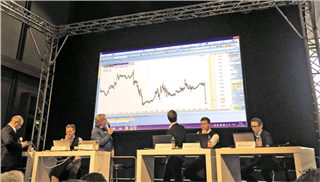 On this year's World of Trading fair the live trading event attracted large audiences. NanoTrader appeared to be the preferred trading platform of the (professional) traders who competed in the live trading event. Four out of the five traders on the event stage use the NanoTrader for their trading. Discover the NanoTrader, download a free demo. We will add write-ups of the numerous professional traders who use the NanoTrader trading platform. Most of these traders provide free trading tools, signals or strategies directly in the NanoTrader or via the WH SelfInvest trading store. The first write-ups cover the following traders: René Wolfram, Birger Schäfermeier, Wim Lievens, Carsten Umland, Wieland Arlt and Eric Lefort. Professional fund manager and trader André Stagge has integrated eight of his trading strategies in the NanoTrader Full trading platform. These strategies are swing trading strategies. Positions are usually kept 24 to 36 hours. In one rare case positions are kept several weeks. 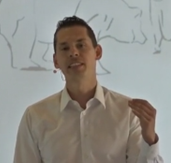 André Stagge worked for a decade as a senior portfolio manager at a major German asset management company. He managed 2,5 billion Euro in clients assets and made more than 500 million Euro in profit (after costs) for his clients. Discover new dimensions in trading... download the NanoTrader Full demo. Range bars are getting more and more popular. With range bars it is not always easy to estimate at what price level the next range bar will appear. The range bars viewer indicates where the next range bar will appear in a chart. Another free trading tool in the NanoTrader. Download a trading platform demo. 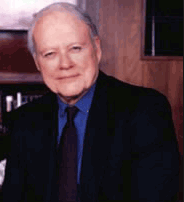 'How to make money in stocks', written by trader William J. O'Neil, is a “modern classic” of the trading literature. Since its first publication in 1988, it has been published several times in a new, updated edition. This review refers to the 2011 version. 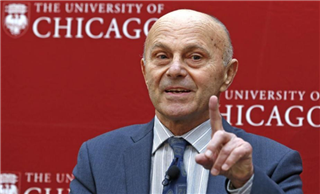 The NanoTrader provides a list for every market of the stocks investors should buy based on the Momentum principle discovered by Nobel prize winner Professor Eugene Fama. Go to the new section. New home page section: Make volatility visible. What is the best time to trade? 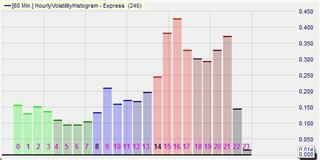 The HVH (Hourly Volatility Histogram) provides the answer. It calculates and visualises the hourly volatility for each market. The most volatile times of the day, are the most interesting for traders. New home page section: Boom! The Bollinger Volatility Explosion. A new section has been added to the website. The section covers the advantages of the Bollinger Volatility Explosion and how it is used in daily trading. Several trade examples are illustrated and explained. John Bollinger, the creator of the Bollinger Bands, states that periods of low volatility are often followed by periods of high volatility. John Bollinger further states that a "volatility explosion" is an opportunity for traders. A sample SignalRader table has been integrated in the website. This live trading table is called Synchro. Five break-out strategies trade in the table. Boost your trading experience! Have a look at the live trading table. The full SignalRadar tool is a component of the NanoTrader trading platform. You can download a real-time NanoTrader demo. Using state of the art technology the free SignalRadar shows live trades being executed by various trading strategies. Interesting trades and trends can be easily identified and similar trades done. The SignalRadar tables contain over 500 instruments, including all major stocks, traded by more than 10 famous trading strategies. The live trades are also visible in the charts. SignalRadar is extremely easy to use. One click to open tables, one click to see trades in charts, one click to order. Test NanoTrader Full: free real-time demo. 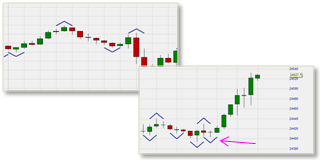 In NanoTrader this chart pattern is detected automatically. The signal is ready to give real-time trading signals. An extensive package of technical indicators based on the Heikin Ashi candles has been added to the trading store. NanoTrader users can activate these Heikin Ashi indicators for free in their trading platform. This free package consists of the 10 most popular technical analysis indicators calculated on the basis of the Heikin Ashi candles. Read more about the 10 Heikin Ashi indicators. 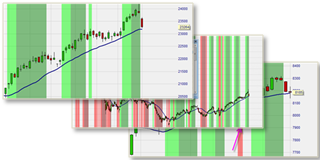 Technical analysis indicators tend to have a 'standard' interpretation. But what if you have an idea interpret an indicator differently? Or if your trading strategy idea requires a non-standard interpretation? 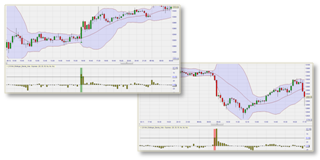 A concrete example using Bollinger Bands is given. Read the article. The screeners section in NanoTrader has been expanded. Besides making your own screeners you can utilize the ready-to-use screeners. Included among the free ready-to-use screeners you find, for example, the popular Today's Trends screener and the 1-2-3-4 chart pattern screener. • 18 ready-to-use screeners are now available. • There are screeners based on chart patterns, today's trend, etc. • The screeners search for indices, oil, gold, US stocks, EU stocks, etc. • Making a screener is easy. Download a free real-time demo of the NanoTrader Full. 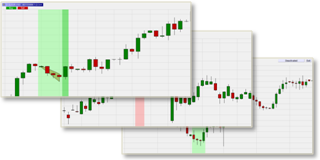 The NanoTrader trading platform automatically detects a variety of chart patterns. These chart patterns include the 1-2-3-4 pattern and the Hammer Blast pattern respectively designed by Jeff Cooper and Stefan Salomon. • The chart patterns are ready-to-use. • The chart patterns are split into categories (candlesticks, famous traders...). • The chart patterns can be used in screeners, trading signals and strategies. • An alarm (mail, pop-up, sound) notifies you when a pattern occurs. A new trading tool has been added to the NanoTrader platform. Trader Kroum 'Koko' Petkov places a lot of emphasis on managing open positions correctly. His free risk management tool for NanoTrader displays pop-up messages providing instant suggestions on how to manage an open position according to his trading approach. Download a free real-time demo of the NanoTrader Full.